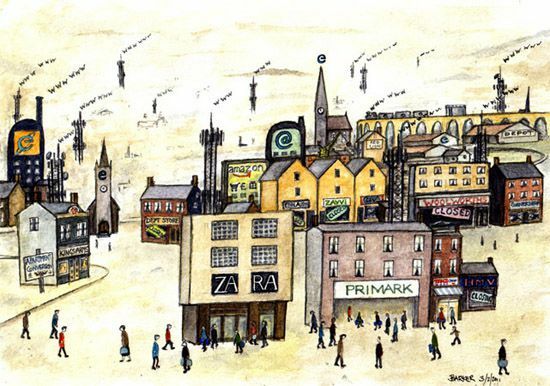 Lowry e-commerce High tech, superfast broadband, online shopping. Property industry, financial comment for Estates Gazette Magazine by Gary Barker. with the new look northern town centre and suburbs. Much of the northwest has undergone great changes over the past 40 years, moving away from traditional secondary heavy industry and manufacturing to a more tertiary service based system linked to financial services and online marketing and sales. Stock warehouses have taken the place of factories and traditional stores such as Woolworths have been replaced by low cost stores such as Primark. Driving this change has been the development of the internet and more recently superfast broadband that now sees a great deal of retail business no longer requiring a physical store at all.